PICKENS, Francis Wilkinson (1805-1869) was a political Democrat and Governor of South Carolina when that state became the first to secede from the U.S.A. A cousin of Senator John C. Calhoun, Pickens was born into the culture of the antebellum plantocracy, and became an ardent supporter of nullification (refusal to pay federal import tariffs) when he served in the South Carolina house of representatives, before being elected to Congress and then the state senate. As state governor during the Fort Sumter crisis, he sanctioned the firing on the ship bringing supplies to the beleaguered Union garrison, and to the bombardment of the fort. After the war, it was Pickens who introduced the motion to repeal South Carolina's Ordinance of Secession, a short speech received in silence, in notable contrast with the rejoicing that had first greeted the Ordinance. Secession date Confederate Autograph Letter Signed “F.W. 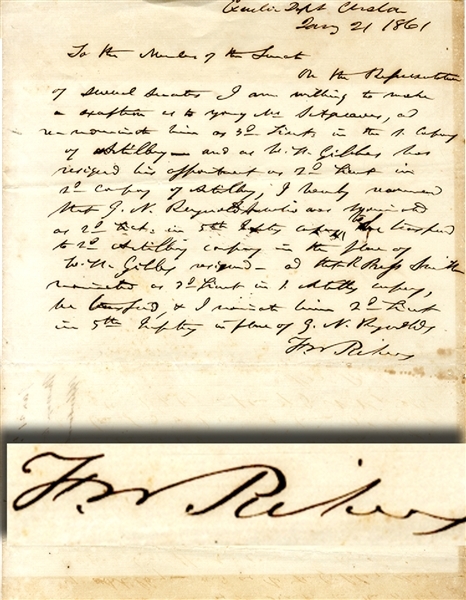 Pickens” as Governor of the State of South Carolina, January 21, 1861, addressed tothe Senate of that state and reads in part: “...On the Representation of several Senators I am willing to make an exception to young Mr. Sitgreaves and re-nominate him as 3rd Lieut in the 1st company of Artillery and as W.H. Gibbes has resigned his appointment as 2nd Lieut in 2nd Company of Artillery, I hereby recommend that G.N. Reynolds...to be transferred...in the place of W.H. Gibbes...” Fine condition.